As a blogger, a large part of my job is working with graphics.  Not only do I edit my post photos, but I also make visuals for my social posts as well as free printables for my readers to use. Additionally, as a parent, I enjoy editing photos of my family and creating a variety of photo art such as holiday cards, planners, calendars and more. As a result, I spend a lot of time on photo editing and graphic design. Therefore, I am always on the lookout for great photo editors. When I do find new programs, I want them to be easy-to-learn and use. I definitely do not want to spend a lot of time having to learn a new program. For the last month I’ve been using Fotor, and I have fallen in love! Not only have I been able to edit photos and create all sorts of graphics, I am using it to make my holiday cards and gift tags, too! 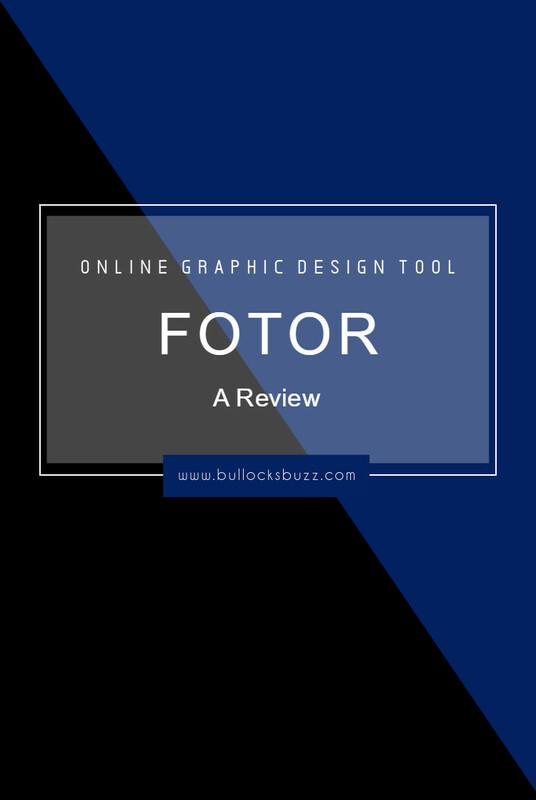 Fotor is a powerful, free, online cross-platform graphic design tool and photo editor that is packed with filters, basic and advanced tools, collages and many other graphic design options. Similar to Canva and PicMonkey, it is simple, intuitive and makes quick work out of my editing tasks. The learning curve is practically non-existent, and editing and designing is as simple as dragging and dropping items with your mouse. Fotor offers multiple image editing tools ranging from 100+ photo effects to stylish templates for creating photo collages. It makes professional-level image editing accessible to everyday users through a simple and intuitive interface. Using Fotor, you can edit pictures that have been uploaded from your computer or transferred directly from a webcam, Dropbox, Facebook, Flickr, Picasa, or even a web URL. And once you are finished editing, you can save your image to your computer either as a PNG or JPG file, print it using your own printer, or you can purchase a print using CanvasPop. You can also easily save it to Facebook, Flickr, Twitter, Tumblr, Picasa, or Dropbox, as well as get a public URL that you can use for sharing the photo. Fotor also gives you unlimited creativity when it comes to graphic design. Create and design your own business cards, greeting cards, posters, gift tags, stickers and more – the options are practically limitless. Plus, with the holidays right around the corner, it’s a great tool for making Christmas and Chanukah cards, gift tags, party invites and thank you cards! 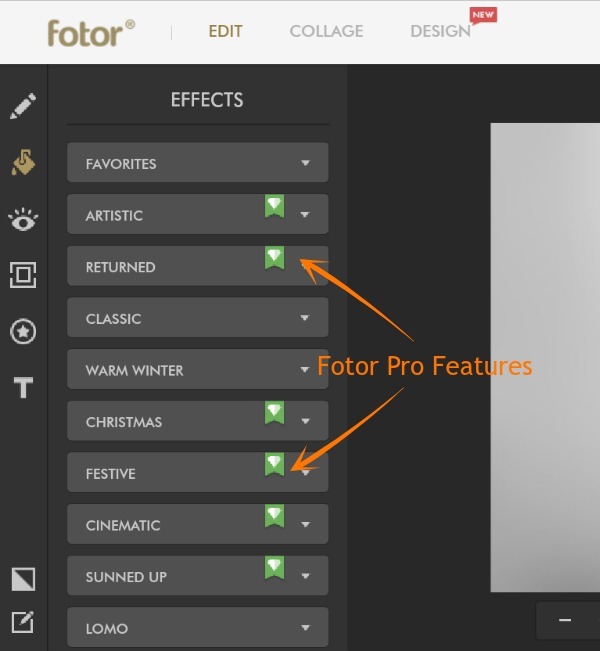 When you first visit the Fotor landing page, you are presented with three different options: edit, collage or design. You are able to use all three functions with the free version, although you will need to create an account to have access to the majority of the features. However, creating an account takes just minutes, and makes it much easier to keep your work organized for the next time you visit the site. You do have the option to upgrade to a pro version, which I’ll tell you about in just a few minutes. But first, let’s check out all the awesome features you get for free! In Fotor’s editing module, you will find all of your basic editing functions such as 1-tap enhance, crop, rotate, resize, the ability to adjust the color, brightness, saturation, curves, and even the option to fine tune the exposure, highlights, and shadows. You also have the ability to add a wide variety of frames, stickers, and text to your photos. Additionally, in the editing module there are lots of unique features such as beauty retouching tools, and a huge range of filters and effects including photo effects, lomo effects, funky effects and many more. One of my favorite features in the editing module is the HDR feature. The High Dynamic Range feature enables you to combine multiple photos with different exposures into a single photo that retains more detail and shows more vivid colors. Using the Fotor collage module you can create professional-looking collages of your favorite photos in just minutes. Choose from a multitude of layouts where you can insert up to 8 or more different photographs. All you have to do is drag and drop your photos into your chosen template, and then go from there to make your collage look any way you’d like. Or you can choose from a large selection of premade templates which are regularly updated to reflect the current season and holidays. With these templates, you simply add your photographs and then you can edit the text to say what you want to say. In the collage module you also have the ability to ability to add borders and frames to your collage, and to select different colors and textures for your collage background. You can also change the overall size and shape of your collage, and even add text, or stickers, or even your own designs…the sky is limit. The Fotor Design module is my personal favorite. With hundreds of different options you can easily unleash your creativity with this feature-packed module. Users can either choose to create their own custom design or choose from one of Fotor’s multiple, pre-existing layouts including social media covers, headers, cards, posters, banner ads, online business layouts and more – with new ones added often. Once you either create or select your layout, you are then taken into the editor where you can choose from hundreds of templates. Creating your design is as easy as dragging and dropping the elements you want to use, all of which can easily be edited to fit your preferred style. With just a few clicks of the mouse, you can edit everything from the background to the font color to adding stickers. Fotor also has lots of free stock images you can use as well. If you look around through the free version of Fotor, you will notice that some of the templates, stickers and advanced design and editing features have a little banner with a heart. This icon denotes the features that are part of Fotor Pro, and seeing them will give you a pretty good idea of the additional features you can get if you upgrade to Fotor Pro. I have been using the Pro version and I absolutely love it. I have access to all of the bonus features, and I don’t have to look at the ads that are along the very bottom of the screen. However, if you don’t have it in your budget to pay for the pro version, the free version still provides plenty of wonderful design and editing features that should be more than enough for both casual and professional Fotor users. Fotor is also available as an app for both iPhones and Androids. I’ve yet to try the app, but if I do, I’ll be sure to let you know my thoughts! And just for my readers, use promo code bullock and get 20% off Fotor Pro! As a blogger I really need a great editing tool like this. I used to have photoshop until I upgraded my computer and the software didn’t upgrade, then I started using picmonkey and I’m a premium user, but even it has its limitations. I’m going to check this out! I found your post on Bloglovin and I’m determined to be the one blogger that actually visits blogs that appear in my feed. Its how we grow right? I blog over at HeartfullyHeather.com, I’d love if you stopped by sometime. Happy Holidays! Definitely give it a try! I really like it. It’s easy to use, and has some unique features. Thanks for stopping by! You are absolutely right, helping each other is how we grow.I am headed over to check you out now! Happy Holidays to you as well.